It said on Wednesday (14 January) that the EU should build new infrastructure to link up with a future Russia-Turkey pipeline or lose access to supplies. Gazprom head Alexei Miller issued the ultimatum during a visit to Russia by EU energy commissioner Maros Sefcovic, who said he was “very surprised” by the statement. The latest announcement comes after Russia said in December it won’t build the so-called South Stream pipeline via Bulgaria and Hungary to Italy in favour of a new project with Turkey. The European Commission blocked South Stream construction on grounds of non-compliance with EU energy law. But both South Stream and “Turkish Stream” have strategic implications because they bypass Ukraine, which earns billions from transit fees and which is on the edge of bankruptcy. Miller noted “the Turkish Stream is the only route along which 63 billion cubic metres of Russian gas can be supplied, which at present transit Ukraine. There are no other options”, AFP reports. He warned Sefcovic to start building “the necessary gas transport infrastructure from the Greek and Turkish border”. “They have a couple of years at most to do this. It’s a very, very tight deadline. In order to meet the deadline, the work on building new trunk gas pipelines in European Union countries must start immediately today”, he added. “Otherwise, these volumes of gas could end up in other markets”. 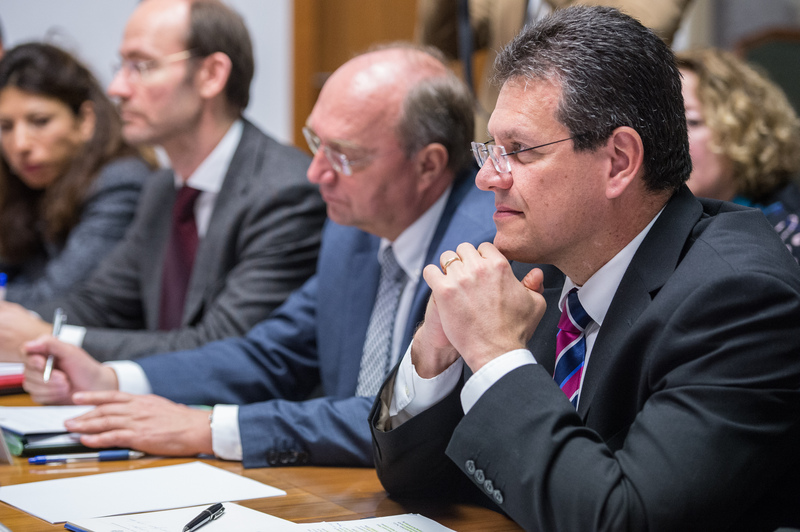 Sefcovic – who was on his first visit to Russia to meet with Miller, Russia’s deputy minister Arkady Vladimirovich Dvorkovich, and energy minister Alexander Novak – reacted frostily to the news. “I believe we can find a better solution,” he said. “We don’t work like this … the trading system and trading habits – how we do it today – are different”. About 80 percent of the EU’s gas imports from Russia come via Ukraine. But political disputes between Kiev and Moscow have seen EU supplies interrupted on two occasions in recent years, with Moscow justifying the Turkey decision by saying Ukraine is “unreliable”. Meanwhile, Bulgaria had asked Sefcovic to use his visit to Russia to pitch a plan for the construction of a gas hub on Bulgaria’s Black Sea coast. But it’s unclear whether Sefcovic managed to raise the subject with his Russian interlocutors.